Our independent record store in Nottingham is located within easy reach of the M1 in the heart of the midlands and is located 2 minutes away from the railway station, for those wishing to come by car there is a private car park for customers at the rear of the shop. We currently carry over 200,000 items including CDs, vinyl records, cassettes, DVD's and books covering a wide range of genres and styles. We pride ourselves on our extensive stock that covers many different types of music, making our record shop a place for anyone to visit, whatever their tastes may be. Due to shelf space not all the stock currently held is on sale but we are adding new stock to the shelves on a daily basis. I am also more than happy to purchase new items to add to my stock, so if you have something special that you would like to bring in, please don't hesitate as you'll be sure to get a great deal. We pride ourselves on being different from many other second hand record shops in that we only sell our vinyl records in store not on the internet. 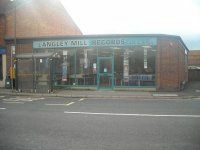 To find out more, or if you're looking for something specific, give Langley Mill records a call or pop in to our shop to see our vast range of products. You just might surprise yourself when you visit our independent record store in Nottingham.